There is probably something many of us hate to admit: there is always a few records that we are just a tiny bit embarrassed about. There are cool and “un-cool” albums. I even feel a bit stupid for writing that, but let’s just put it this way – people will be much more impressed by your girl group collection or that rare 80s post-punk album you spent a small fortune on. But there are always those albums that were probably meant for charity shop bins. Your Barry Manilows and Barbra Streisands. And I have Billy Idol’s Vital Idol. Yet despite being intrinsically uncool. I kind of really love having this piece in my collection. 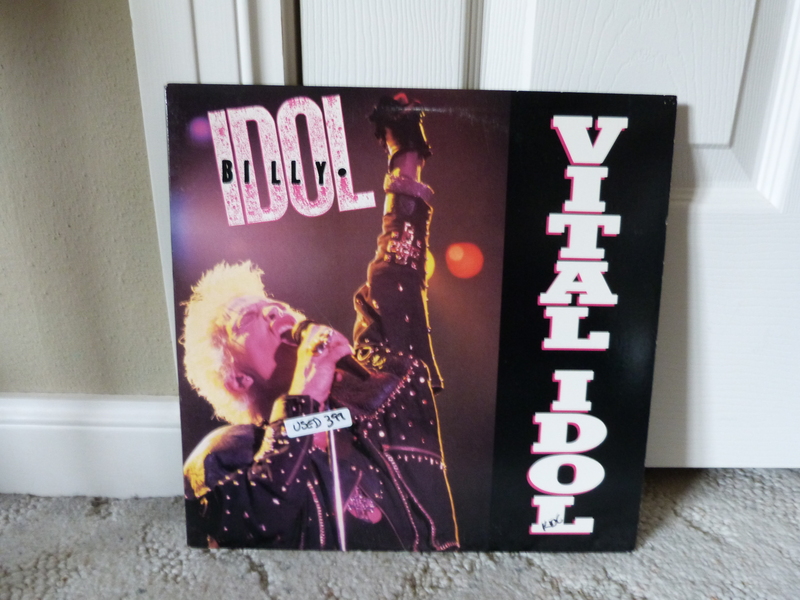 Vital Idol, to me, always sounded like the perfect title for a greatest hits album. In a way, that’s what you get here. Hits like “White Wedding” and “Flesh For Fantasy” make an appearance. But this isn’t just any album. No – the songs included are not the originals. Instead they remixed them for what I suppose was the 80s club scene. The term “remix” used loosely here as they seem to just be all the songs stretched out to hit the 5 minute mark. In the “White Wedding (Shot Gun Mix),” someone thought it would be a good idea to mix in Idol shouting “ROCK!” and “DY-NO-MITE!” Fine enough, but then they it had to echo his yelps. It’s cringe-worthy, but somehow remains pretty fun. Several of the mixes work fine enough like “Flesh For Fantasy” and Dancing With Myself” (because it is difficult to actually pick out the difference between the remix and the original). This probably isn’t something I would seriously recommend to anyone. The remixes really aren’t mixes, and it doesn’t really include all Idol’s hits to really be a complete “Greatest Hits.” I have a strange affection for this album despite all its silliness. Someone at my high school owned the album on cassette. The first time I heard it, I thought it was pretty hilarious. I immediately thought this would make a great workout soundtrack. You know, for those of us who enjoy pushing ourselves to the limit of cheese. Yet despite the album’s obvious flaws, I really grew to like this little one. This copy was grabbed in the used section in a record store. There was a huge chunk out of it so it skips a bit, but it was 50% off $3.99 so I didn’t give a damn either way. Plus it’s a remix album, right? Why not throw your own personal touch on it? Anything to justify the fact I didn’t actually check the album before I bought it. Lesson learned that hard way. Buying albums just to look cool is kind of a stupid way to live your life. While Vital Idol probably won’t be gaining me any cool points in the future, I’d like to think that anyone who could understand the strange goodness of this album to be a kindred spirit.